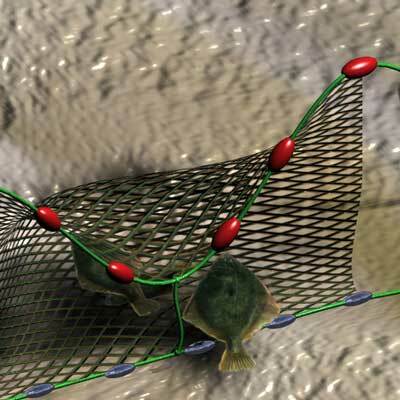 Catching flounder and other flat fish in set nets is simple if the net is deployed correctly. Most inshore commercial fishing boats targeting flatfish in harbours are open, purpose built dory style gillnetters. Recreational fishing with set nets can be undertaken by wading out from the shore and dragging the net, although deploying the net from a small recreational fishing boat with a clear stern area is much more productive. Putting the net onto sacking or tarps which are draped over the gunwhales, outboard motor, fuel lines, and control cables will reduce snagging aboard the vessel and ensue speedy tangle free sets. The nets stocked by PFK are supplied in a large plastic container with a lid and are ready to use as a drag net. Drag netting requires on person at each end of the net to haul it through the water towards the shore. The flat-fish are caught in the belly of the net which forms naturally as the depth of water reduces. To deploy these nets as a set net you will need anchors, floats to mark each end of the net, and recovery ropes. We also reccomend tying down the net at intervals to form a belly in deeper water. Below is a collection of dual purpose flounder nets available online. These nets are 24 meshes deep fully slung on float and lead ropes and the mesh size is 4-5/8 inches (117mm). The net meshes are monofilament nylon. Recreational set netting methods for flounder fishing differ around the country. The best flounder fishing tip to improve efficiency in flatfish nets is to tie down the float rope at regular intervals to form a belly in the net. Tying down the net also reduces unwanted by-catch and acts like a flounder trap while fishing. 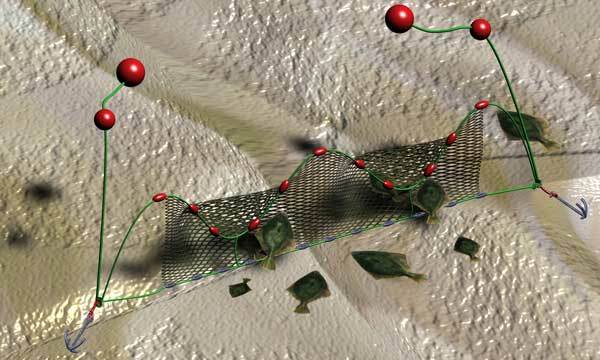 When the net is hauled the flatfish are retained in the belly of the net even if they are not properly gilled in the mesh. A tie down every third of fourth float around 500mm long is sufficient for catching flounder in most areas. Note : The 3D fishing rig diagams below do not show the net or mesh to scale. For a larger view click the netting flounder pictures below. Actively fishing the net - rather than setting it and leaving it to fish over a tide or at night - is the best way of catching fresh, top quality flounder. Flounder caught in nets which have been left to soak overnight are often dead and starting to decompose, or have been damaged by sea lice before the fisherman picks the net up. It is unlawful and wasteful to set nets where they are left high and dry as the tide recedes or to stake the net. Measuring flounder to ensure they are legal sized should be undertaken as the net is hauled so undersized fish can be returned to the sea alive. Setting the net on an outgoing tide in blind channels and beating the surface with a stick or plunger (called plonking) to chase the fish into the net is very effiective - commercial fishers often use this method when set netting for flounder, mullet and trevally. Always use good anchors capable of holding the net, plus a big stingray or two against the prevailing current. Stingrays caught in the net should not be boated are best released by vigourous shaking over the side - or if too badly meshed - by cutting the barb off with a sharp knife. In the event that a stingray has to be boated, put it well out of the way to avoid accidentally stepping on it. Don't set your net in fast currents, areas covered in oyster shells or areas where weed is prevalent - and be aware that heavy rain often brings big clumps of grass, weeds and trees offshore and into the channels. Don't set nets until the flotsan in the water clears after a storm. Salt water fishing flounder with nets is easier than setting in brackish or freshwater where logs, twigs, leaves and other rubbish can add to the list of things that will clog the net. Use big floats at both ends of the net and make sure they are big enough to stay on the surface against the current - double floats as per the diagram are a good idea. Make sure the recovery ropes are long enough to stay on the surface at all stages of the tide, many nets are lost because the floats are pulled under at high tide. Both of the floats have to be clearly marked he floats. If used incorrectly set nets can be lost and continue ghost netting fish for years, this is extremely wasteful of our precious marine resources. Also, setting in some areas can cause mammal and seabird by-catch. Set net by-catch of Hectors and Maui dolphins are of particular concern and seals, commorants, gannets, turtles can sometimes become ensnared. Some areas are closed to set netting to protect marine mammals, heavy penalties are likely if you are caught netting in these areas so check the Ministry of Fisheries set net regulations if you are not sure where to set your net. Click the next button on the bottom of each page of the Ministries set net website to see all the pages of useful information they have online. There are a variety of restrictions on net mesh sizes for taking particular species as detailed in the “FINFISH - Bag limits and size restrictions” section on the Ministry of Fisheries website. In some cases the minimum sizes for other nets such as drag nets are different from the minimum mesh sizes for set nets and minimum size limits vary according to species of flat-fish taken. Check and understand all the set and drag net regulations and closed areas before you go!